This is a regional snack of my hometown Hokkaido. 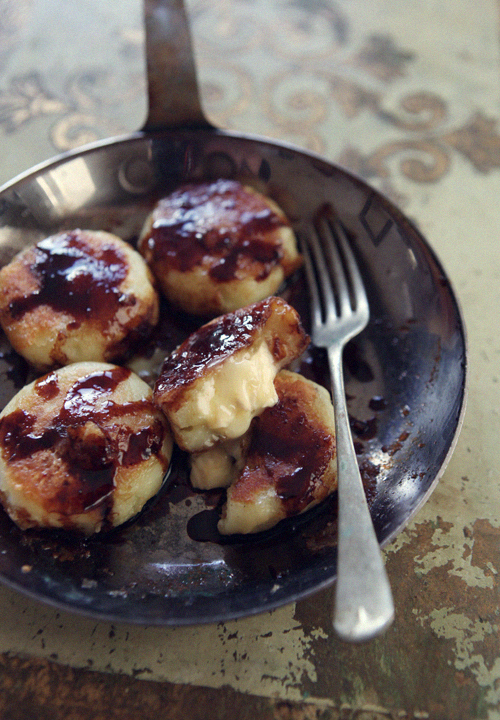 The combination of butter and soy sauce is very popular in Japan, it works perfectly well with this potato cakes. 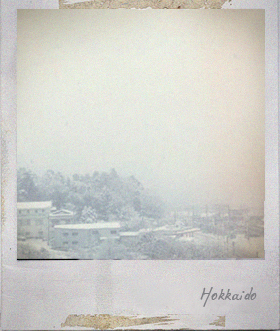 Hokkaido must be covered with snow as far as the eye could see now. Everything is white. I miss the scenery. Cook the potatoes in lightly salted boiling water for 10 minutes, until tender. Drain and mash. Add the the corn flour and salt, mix everything together well with your hands. Divide the potato mixture into 12 portions, take one portion in your hand, press a piece of camembert cheese into middle. Shape the potato cake into a cake. Heat the butrter in a large frying pan over a medium heat. Fry the potato cakes for about 5 minutes each side or until they are golden, crisp and heated through. Heat the soy sauce and sugar in a small sauce pan over a medium heat, stirring constantly until the sauce is thickens and syrupy. Drizzle the sauce over the potato cakes. You are currently reading Camembert Cheese Potato Cakes at Fish Trip Cafe.